Last night a Goodreads reader named Cynthia posted a question on my page: “What will you do if Lilac Girls wins The Goodreads Reader’s Choice Award?” I told Cynthia I would shout it to the rooftops since my goal in writing the book was to get the word out about this incredible group of Polish political prisoners, The Rabbits, who endured so much after surviving Nazi experiments at Ravensbruck. That is so true, but this morning I woke up thinking of another special group of women, the Rabbits who didn’t survive. Nine young women who also lived through the brutal experiments but were marched, some of them carried, since they were still recovering, to the shooting wall and executed. All because they volunteered in the Polish underground to sabotage the Nazi effort. It has been a teary morning assembling their pictures, such lovely young women who never had a chance at life, but I wanted to post their faces and names so we can remember and honor them for their courage and dedication to fighting the Nazis, for standing up for what is right. Thank you for supporting Lilac Girls. Thanks to you, the whole world is learning their story. And it has only just begun. 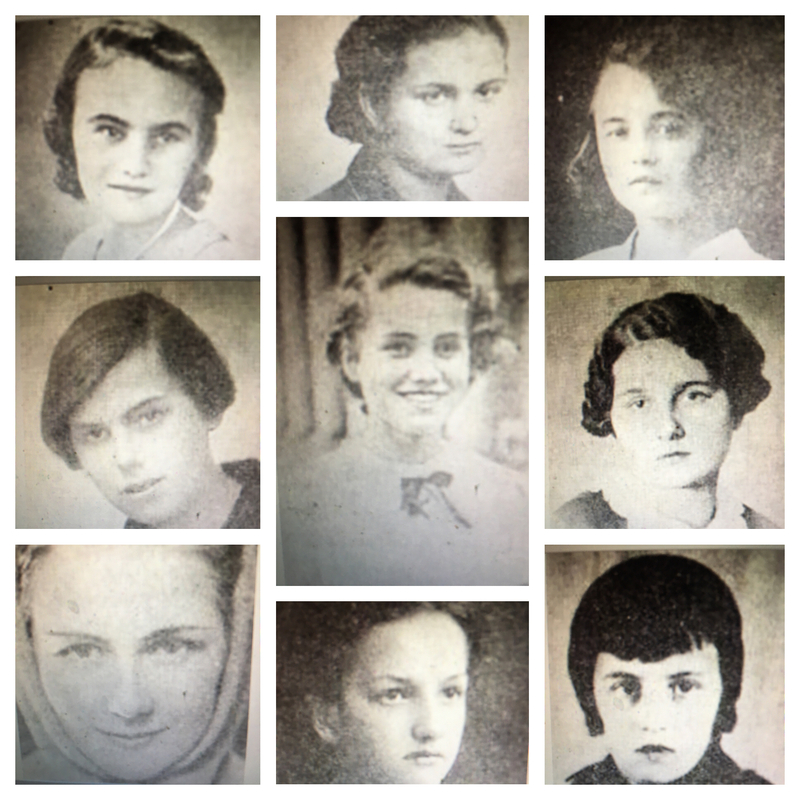 Irena Poborowna (center) Clockwise from top: Janina Flak, Wanda Kakowska, Wanda Polakowska, Malgorzata Dembowska, Romana Sekula, Zofia Szachowicz, Henryka Dembowska, Krystyna Krauzowna. One of the top 5 books I have ever read! Lilac Girls was one of the finest books I have read. And I have read much in my 65 years. Thank you so much–that is very kind of you! Just completed reading your novel about the “Polish Rabbits.” As “M C Dewey” so appropriately stated in her aforementioned comment, “Lilac Girls was one of the finest books I have read.” In my 63+ years of life as an avid and voracious reader, I have read thousands of books. This one was amazingly extraordinary, exceptionally well written and meticulously and accurately researched. It touched me deeply and emotionally affected me in unforeseen and unexpected ways beyond my imagination or memory. Will eagerly await and look forward to the release of your much anticipated “prequel” to The Lilac Girls. Thank you. What an extraordinarily lovely note, Fran. I so appreciate the kind words. Just thrilled you enjoyed Lilac Girls! Thank you so much for writing Lilac Girls, I just finished listening to it on Audible and I can’t stop thinking about it and researching everything further online. I was born and raised in Legnica, Poland in December 1980, I moved to New York in 1999 and now I live in Boca Raton, Florida. I was always fascinated with the history of my country. I’ve always read historical and historical fiction books available on the subject. Your book is my favorite by far. I love the detail and accuracy of the historical facts as well as fun facts from Polish Culture. It is not easy to find interesting books about the Polish women experience during the war written by other than Polish authors. Do you have any suggestions for other books that I might enjoy about that time in history? Are you in the process of writing anything right now? What an odyssey of your own you’ve had! I’m just thrilled you enjoyed Lilac Girls. While writing it I tried to be very true to Polish traditions so I’m happy to hear that part of it resonated with you. What a fascinating culture! One book you might enjoy is Castles Burning: A Child’s Life in War by Magda Denes. It is a memoir of sorts and is about Hungary, not Poland but it is gripping read. It is available on Amazon. And yes, I am working on the prequel to Lilac Girls now, which takes place in WWI. So excited to share it! I’m patiently awaiting the prequel to Lilac Girls, thank you for deciding to write it. I am now reading your book in print (as I listened to it first), love it even more. I also purchased polish translation for my Mom’s birthday, can’t wait to read it in my native language as well. How wonderful, Joanna! What a great daughter you are, getting it in Polish for your mother. I’m curious how the Polish translation is. You’re the only person I know that will have read both! Mom loved the Polish version of your book, just as I, she was also very impressed and she is a tough critic 🙂 Thank you!! That makes me so happy, Joanna! I’m not sure who Random House had in mind when designing the cover, but to me, the three women represent the three Polish women in the book–Matka, Kasia and Zuzanna. So glad you enjoyed the book! I read Lilac Girls a few months ago. It was on the ‘Lucky Day’ shelf at our library. Needless to say, I thought it was an amazing story and very well written. My husband just finished it and we had a long talk about the Rabbits this afternoon. I am telling all my friends who are in book clubs to be sure to include it soon! Thank you, Martha! Thank YOU, Patti for getting the word out. Very happy you enjoyed the book! I have just finished Lilac Girls this morning, after fitting in reading it over 3 days (with 3 boys at home on school holidays!). I absolutely loved it, I couldn’t put it down. I’ve read many books based around this era and yours is hands down my favourite. Congratulations on an amazing book! I’m just thrilled you enjoyed Lilac Girls, Simone! I just finished Lilac Girls and found it gripping, disturbing and something everyone should read. I am old enough to remember seeing elderly people on the Boston subway with their numbers tattooed on their wrists. My younger daughter married a man of Polish descent so much of the foods , etc, mentioned are very familiar to me from our Polish christmas Eve celebrations . I am nagging her until she reads the book and tells her in-laws about it. This is a book I will not forget. When visiting Germany years ago my husband and didn’t want to visit the camps too depressing. Now I wish we had. I will look for any other books you write, looking forward to the prequel. So happy you enjoyed Lilac Girls. I really appreciate your kind words and sharing your memories! ? It would be great to have the kick-off held in CT. That way, those of us unable to travel abroad could send you off and “follow” you! What a wonderful book. I truly loved it. The greatest praise that I can give a book is that I cried with the characters [ I even had to put it down when the story was too emotional]. Your characters were so well drawn- I could “touch” them. Even though I read many books with a similar WW II /concentration camp theme, yours was fresh and your story so well told. You are a truly gifted writer to be able to create such an exciting story with beautifully drawn characters and historical accuracy. Thank you for writing “Lilac Girls.” I recommend it to everyone. Wow, Lea. What a nice note…really made my night! I have read many books, both fiction and non-fiction, on World War II and the Holocaust. This, by far, is one of the best I have read. I listened to it on CD while commuting to and from work. I told my husband that if I was reading a hard copy of this book, there is no way I would have put it down. The narrators did a wonderful job and I think they helped accentuate the characters even more. I see many people asking about who the three women on the cover are. I thought they were Caroline, Kasia and Zuzanna. As I started reading your book, I realized I had Sarah Helm’s book on my bookshelf, having bought it a year or so ago. I will be reading that one after I decompress from your book. I am looking forward to your next book! I’m so happy you enjoyed Lilac Girls, Mindy. I agree the actors who perform the audio book are incredible! ? Our book club met last night and we had a great discussion! We have read many books about the Holocaust and WWII as a good and individually, but yours was among the best. There were some members who wondered about the book jacket. Did you choose it? Do you have input into the decision? Several thought the cover was misleading, as if the 3 women were friends from the outset, or would be by the end of the story. Of course, it became obvious neither was the case. But it was commented on by several members that of late, some book covers are presented in a way that does not reflect the story about to be told. Regardless, we all enjoyed the story very much. One of our members even had a copy of the Victoria magazine that started your search! I just finished reading your book and it touched me in ways I never imagined. It’s important to remind the world how evil people can be. Unfortunately, history continues to repeat itself. Why do people embrace hate so easily? Are they mostly motivated by fear? Thank you for writing this wonderful, important and relevant story. You are so welcome, Diane. I’m so happy you enjoyed the book and I agree, it’s important to remind people of the evil of the past so we don’t repeat our mistakes. Thank you for giving us your book LILAC GIRLS. i’ve enjoyed your writing style so much that I am seriously considering starting the book over again as soon as I finish reading the last sentence! I love it Frankie! ??? thank you for this book. I have tears in my eyes. I have to wait to visit the bellamy-ferriday home until May, and can’t wait to just walk in that home and think of those brave women. I’m so happy you connected so strongly with Lilac Girls, Janice. I bet you will love touring the house in the spring! We are having a celebration up at the house on June 10th, which should be fun, if you are in the area then! I read your book in 3 days (while working full time and with a toddler at home). I simply didn’t want to put it down. Upon finishing I can’t stop thinking about the ‘rabbits’ and all they had to endure in such a cruel and unfair world. I’ve been doing some research and gathering more information and understanding. Thank you for writing this book to share their story and help them be remembered. What a beautiful note, Heather. It sounds like you love the rabbits’ story as much as I do. I agree they need to be remembered and thank you for help make that happen! 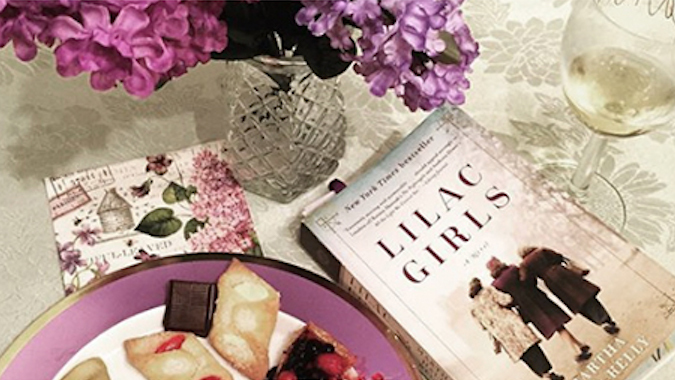 Having finished reading Lilac Girls for my book club selection, I cannot wait to discuss the book with the ladies on April 25th! I wish I lived closer to CT to attend your event on June 10th at Caroline’s house. Have you ever thought of doing a book signing in the Phila., PA area? I was just wondering. We are located outside of the Phila. Thank you for writing this story! I just finished a big book tour and sadly, Philadelphia was not on it, but maybe next book! I hope you have an interesting book club discussion–did you know there are book club questions at the back of the paperback? Also on my website. Too bad you can’t come to the house on June 10th but I will take lots of pictures and post them on my blog! p.s. If you have a minute send me a picture of your bookgroup together and I’ll add it to my bookclub gallery page on the website! THX for all of your work obviously put into this novel. Loved the book…can’t wait for the movie! You’re so welcome! No movie yet but wouldn’t that be great? While I was reading “The Lilac Girls” I was deeply moved and forever touched by these brave and sweet girls and sad to say goodbye to them when I finished the book. I will never forget their story and will always feel blessed for the life that I have. Thank you for your lovely note, Karen! I loved this book so much, I couldn’t put it down. I took it everywhere and read it every spare moment I had! Easily in the top three books I have ever read! I can’t wait to discuss this book at book club! Thank you for all the time and research that went into making this book so special and beautifully written…. Definitely recommending to EVERYONE. So glad you enjoyed it, Amber! ? what a profound book you have written! Growing up in Russia, I had a lot of exposure to the stories of the Nazi occupation and the atrocities that were committed during the war. I keep thinking that there is nothing else to find out about the horrible acts that happened, and here is your story about the “Rabbits”… Shameful and despicable actions of “research” surgeons are overwhelming. I’m glad you have displayed the photos of the girls who didn’t survive the Ravesbruck. It breaks my heart to see how young they were. I so appreciate your thorough research and ability to find their images. I loved the “Author’s note” at the end of the book – it was so interesting to read about your process of research. I cannot wait to the prequel (I’ve read on this website the part of it takes place in Russia). Thank you for publishing these women’s photos and names. They, too, deserved to be remembered! Previous postPolish Lilac Girls Arrives.